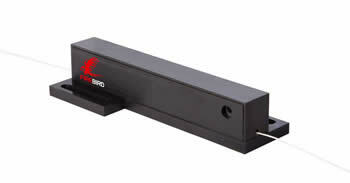 The Phoenix in-line electronic polarization controller is built using the Phoenix in-line scanner. Three knobs are attached to the top of the unit for manual control, giving complete coverage of the Poincare sphere. The EPC alone requires analogue voltage control to operate. However, bought together with the PCI microprocessor interface, the EPC can be connected directly to a PC and controlled through the provided software. The all-fibre in-line polarization controller operates using Phoenix’s unique thermal technology. This technique offers very stable polarization scanning with excellent environmental stability in comparison to competing technologies. In addition, the device is fundamentally less expensive to manufacture offering significant cost benefits while not affecting design and manufacturing quality. This version of the polarization controller has the microprocessor integrated within the package and is fully controllable using the same sofware as used for the EPC/PCI combination.